Three new additional models now grace Honda’s Foreman ATV range, which bring with them independent rear suspension and improved transmission. James Rickard tests drive the new models. 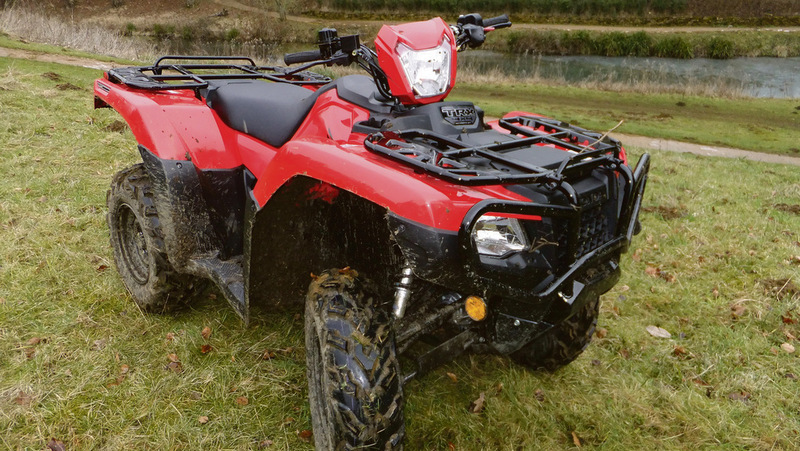 It may not seem two minutes since Honda last overhauled its ATV range, but it was in fact 12 months ago. Since then its designers in South Carolina have been back to the drawing board and extended the TRX 500 Foreman range with three additional models incorporating several new features. Foreman range receives independent rear suspension (IRS) and double-clutch transmission (DCT) technology. The new models are the TRX 500 FM5 (with manual transmission and IRS), the TRX 500 FA5 (automatic transmission and IRS) and the TRX 500 FA6 (automatic transmission, IRS and EPS). 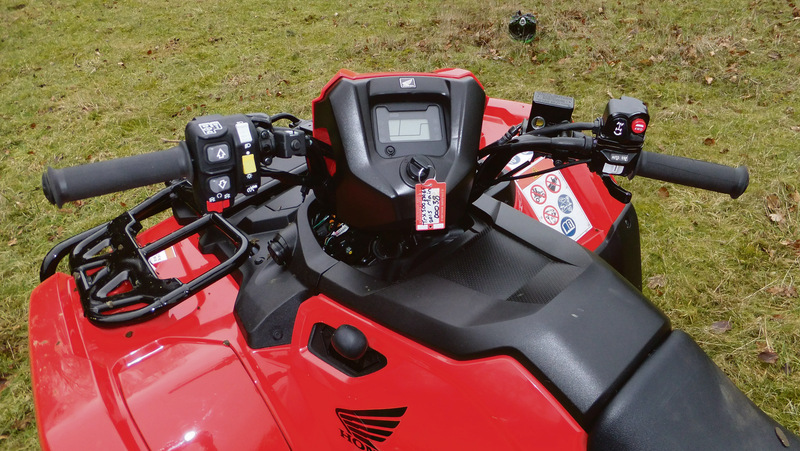 To find out what has changed and how these impact the TRX 500, we tried out the top-of-the-range FA6 in a forest in deepest, darkest Oxfordshire. One of the most fundamental additions to the three new models is the inclusion of IRS. Building on the updated main frame from last year, the manufacturer has created a modular IRS unit which effectively bolts on the back. In doing so, torsional rigidity is increased which helps with the bike’s stability and traction. And, in theory, wear and tear should be lower too. 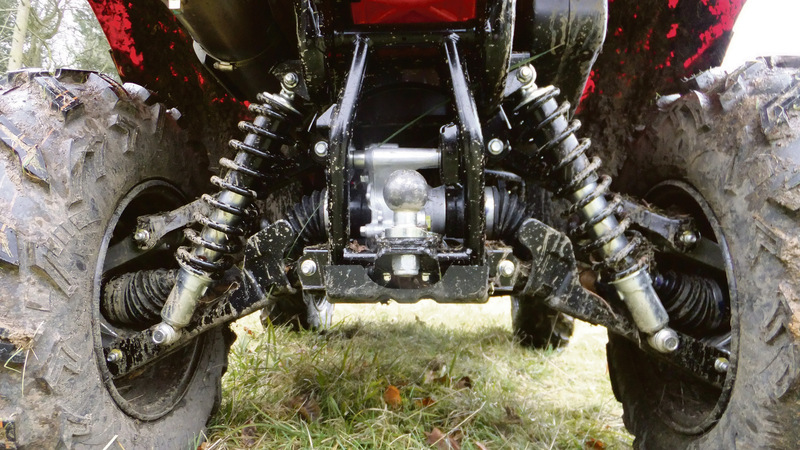 Increased suspension travel is also available, keeping the tyres in contact with the ground more of the time. However, when towing, you do feel the load a lot more as the rear suspension now has to cope with this too, compared to before where the trailer would be hooked onto the trailed axle after the suspension. The next major change for the Foreman is an updated transmission. Using DCT, the FA6’s five-speed transmission can be driven in one of two modes; manual, using electric shift buttons, or fully automatic. Both modes are self explanatory, however, the automatic mode is much more refined compared to its predecessor. Using a dual-zone shift map, the transmission has the ability to adapt to your style and the changing conditions. This results in a much more responsive transmission with less gear fishing and improved kick-down. To further extend functionality, a low range has also been added to the new models. One of the main bonuses of a transmission which uses gears, compared to a continuously variable type, is the fact you get lots of engine braking, giving confidence to tackle descents, even with the heaviest of loads. Power-wise, all the Foremans have adopted the use of 475cc motors which manage to deliver the same power and torque as the old 499cc units but with 12 per cent less fuel consumption, says the manufacturer. Like the transmission, the engine also features dual maps to adapt to any driving style, from plodding to rallying. On the practical front, the uprated suspension means carrying capacity on both the front and rear racks has been boosted by 5kg, now capable of 85kg at the rear and 45kg at the front. Rack sizes have also grown and now feature more tie-down points to secure loads, along with the inevitable home-made accessories. Towing capacity has been substantially bolstered, up to 600kg from 385kg. We can confirm it is quite capable of managing this, and then some. For increased protection at the front, a new wrap-around bumper has been fitted, which also includes space for a winch. To see more, watch the video! While the last updates focused on getting the reliability to where it should be, this time the engineers have looked at performance and comfort. And it shows, especially with the improved ride. Some may say the improvements are about time too, particularly when most of its competitors have been using IRS for a long time. Transmission could not be simpler, especially in automatic mode, and it does give you one less thing to think about. However, on a machine which will spend most of its time bouncing round hillsides and wallowing in mud, how durable are all these electronics going to be? Overall, the three new TRX 500 models are a much welcome addition to the Foreman family, bringing with them ease of use and practicality.